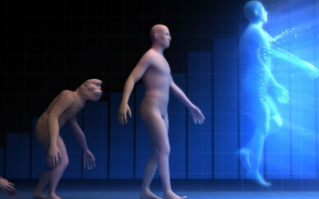 La humanidad está a punto de la transición, hacia “evolución por dirección inteligente” 4 fuerzas clave para la evolución y transformación de la humanidad. As we close out 2016, if you’ll allow me, I’d like to take a risk and venture into a topic I’m personally compelled to think about, a topic that will seem far-out to most readers. Today’s extraordinary rate of exponential growth may do much more than just disrupt industries. It may actually give birth to a new species — reinventing humanity — over the next 30 years. I believe we’re rapidly heading towards a human-scale transformation, the next evolutionary step into what I call a “meta-intelligence,” a future in which we are all highly connected — brain to brain via the cloud — sharing thoughts, knowledge, and actions. In this blog, I’m investigating the driving forces behind such an evolutionary step, the historical pattern we are about to repeat, and the implications thereof. Again, I acknowledge that this topic seems far-out, but the forces at play are huge and the implications are vast. 1.5 billion years ago, these early eukaryotes began working collaboratively and formed the first “multi-cellular life,” of which you and I are the ultimate example (a human is a multicellular creature of 10 trillion cells). The final step I want to highlight happened some 400 million years ago, when lungfish crawled out of the oceans onto the shores, and life evolved from the oceans onto land. Today, at a massively accelerated rate — some 100 million times faster than the steps I outlined above — life is undergoing a similar evolution. In this next stage of evolution, we are going from evolution by natural selection (Darwinism) to evolution by intelligent direction. Simple humans today are analogous to prokaryotes. Simple life, each life form independent of the others, competing and sometimes collaborating. Just as eukaryotes were created by ingesting technology, humans will incorporate technology into our bodies and brains that will allow us to make vastly more efficient use of information (BCI) and energy. Finally, humanity is about to crawl out of the gravity well of Earth to become a multi-planetary species. Our journey to the Moon, Mars, asteroids, and beyond represents the modern-day analogy of journey made by lungfish climbing out of the oceans some 400 million years ago. Today, there are 2.9 billion people connected online. Within the next six to eight years, that number is expected to increase to nearly 8 billion, with each individual on the planet having access to a megabit-per-second connection or better. The wiring is taking place through the deployment of 5G on the ground, plus networks being deployed by Facebook, Google, Qualcomm, Samsung, Virgin, SpaceX, and many others. A multitude of labs and entrepreneurs are working to create lasting, high-bandwidth connections between the digital world and the human neocortex (I wrote about that in detail). Ray Kurzweil predicts we’ll see human-cloud connection by the mid-2030s, just 18 years from now. The end results of connecting your neocortex with the cloud are twofold: First, you’ll have the ability to increase your memory capacity and/or cognitive function millions of fold; second, via a global mesh network, you’ll have the ability to connect your brain to anyone else’s brain and to emerging AIs, just like our cell phones, servers, watches, cars, and all devices are becoming connected via the Internet of Things (IoT). Next, and perhaps most significantly, we are on the cusp of an AI revolution. Artificial intelligence, powered by deep learning and funded by companies such as Google, Facebook, IBM, Samsung, and Alibaba, will continue to rapidly accelerate and drive breakthroughs. Cumulative “intelligence” (both artificial and human) is the single greatest predictor of success for both a company or a nation. For this reason, beside the emerging AI “arms race,” we will soon see a race focused on increasing overall human intelligence. It is an exponential atop an exponential. More intelligence gives us the tools to solve connectivity and mesh problems and in turn create greater intelligence. Finally, it’s important to note that the human race is on the verge of becoming a multiplanetary species. The bottom line is that change is coming, faster than ever considered possible. All of us leaders, entrepreneurs, and parents have a huge responsibility to inspire and guide the transformation of humanity on and off the Earth. What we do over the next 30 years — the bridges we build to abundance — will impact the future of the human race for millennia to come. We truly live during the most exciting time ever in human history. Disclaimer: Futurism only supports products that we trust and use. This post is in partnership with Abundance 360, and Futurism may get a small percentage of sales. Want to take a class with Peter Diamandis? Click here to learn more!